The shelf life of products is largely influenced by water vapor and oxygen. Study shows that if the headspace of the package is controlled, the shelf life can be improved and would help ensure the quality of the product in storage. In principle, the gas composition inside the package is difficult to change or control because product filling is completed until the package is unlocked. Packaging materials having barrier property can only prevent the permeation of gas from the package, but the residual oxygen and other kind of gases would still be contained in the package. As a result, CAP and MAP packages are commonly used to reduce the content of certain gases. Nitrogen and carbon dioxide are often used in package, but longer storage periods can change the gas composition gradually. Therefore, it becomes rather complicated to assess the quality of product, gauge the shelf life, and design an appropriate package. However, this issue can be overcome with headspace gas analysis, which provides a means to analyze the gas composition contained at the top of the package, inspect the package quality, and verify the productâ€™s shelf life. Carbon dioxide and oxygen gases are the key target of headspace gas analysis. A critical gas composition in MAP and CAP packages, carbon dioxide gas directly regulates the flavor and quality of products. In pharmaceuticals, carbon dioxide content is very important because some medicines can react with this gas and become useless. Oxygen gas not only destroys the foodâ€™s nutrients, but also oxidizes the oil in food products. This deteriorates the food and makes it rancid or toxic. Moreover, oxygen is required for bacterial reproduction, which is the main cause of food deterioration. 6000 Series - The Gaspace 6000 headspace analyzers offer high levels of performance technology and operator ease to fulfill the latest industry demands for accuracy and reliability. These highly advanced instruments are equipped with integral sampling systems, unique, miniature, long-life, zirconia and infrared sensors to deliver the most accurate and repeatable performance possible. 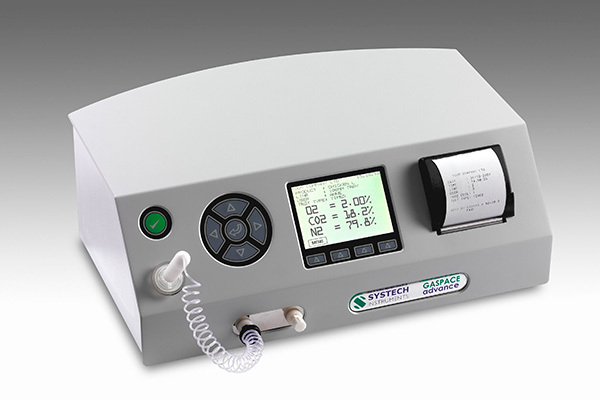 The Systech 6000 range offers three different models to accommodate your oxygen and carbon dioxide measurements. GS 6500 - measures oxygen levels only using the non depleting Zirconia sensor. GS 6600 â€“ measures both oxygen and carbon dioxide levels using the non depleting Zirconia sensor and solid state Infrared sensor. GS 6700 - measures carbon dioxide levels using the solid state Infrared sensor. Gas Space Advance -	This carbon dioxide (CO2) and oxygen (O2) headspace analyzer provides consistently reliable results and simplicity in operation allowing you to maximise your production efficiency. Its large buttons and clear display ensures testing is simple, errors are eliminated and no special operator training is required. Numerous packs can be tested quickly with just one button press, saving time and making Quality Assurance more efficient. These MAP analyzers can test all pack sizes and very low volumes. There are a variety of ways to perform analysis; Timed Tests, AutoSense, Peak/Valley, Syringe Direct Injection or Continuous Testing. Fast configuration and selection provides the test method which is best for you. Easy to see Pass and Fail messages speeds up the analysis process and removes any uncertainty with interpreting measurements. The Gaspace Data Manager software allows you to download results stored on your gas analyzer and upload new settings. You can also search through your stored data by time, date, user, production line or any of the product information. GS1 - measures oxygen levels only using the non depleting Zirconia sensor. GS2 â€“ measures carbon dioxide levels using the solid state Infrared sensor. GS3 - measures both oxygen and carbon dioxide levels using the non depleting Zirconia sensor and solid state Infrared sensor. Gas Space Advance Micro - The Gaspace Advance Micro oxygen (O2) and carbon dioxide (CO2) headspace gas analyzer is ideal for the food and pharmaceuticals industry. Features include automatic calibration, diagnoistics and control providing repeatable, accurate results and exceptional performance, which is essential for HACCP compliance. Its large buttons and clear display ensures testing is simple, errors are eliminated and no special operator training is required, maximising production efficiency. The Micro is designed to analyze very low volumes of headspace, less than 1cc, using: Timed Tests, AutoSense, Peak/Valley, Syringe Direct Injection or Continuous Testing. Using AutoSense a number of packs can be tested quickly with just one button press, saving time and making Quality Assurance more efficient. Pass and Fail messages speed up the analysis process and remove any uncertainty with interpreting results. The Gaspace Data Manager software allows you to download results stored on your analyzer and upload new settings. You can also search through your stored data by time, date, user, production line or any of the product information.